Born on 2 January 1891 in Kingston, Ontario - son of late James and Catherine Conley, Kingston, Ontario - had three sisters, including Kathleen and Luella - at time of enlistment in 1915: trade as broom maker (at Bailey's), single, no current military service, previously served seven years with the bugle band of the 14th Regiment Princess of Wales' Own Rifles, Church of England, height of 5 feet 5 inches, chest of 35 inches fully expanded, ruddy complexion, blue eyes, dark brown hair. 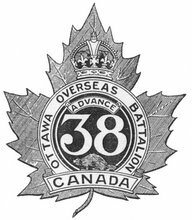 Joined the 38th Battalion, CEF, in Barriefield Camp, Ontario, on 27 July 1915 (number 410253) - served with the 38th Battalion during its period of garrison duty in Bermuda - landed in France with the 38th Battalion on 13 August 1916 - wounded on 2 November 1916 - rejoined the 38th Battalion on 8 November 1916 - wounded on 9 April 1917 - wounded on 26 June 1917 - invalided to England on 2 August 1917 - rejoined the 38th Battalion on 2 November 1917 - killed in an accident while showing how to throw a hand grenade on 14 February 1918 - buried in Villers Station Cemetery (grave XI.B.3), France. (New information courtesy of Peter Gower's book cited below).